Take a deep breath. Feel the warm breeze on your face while you enjoy the smell of fresh cut pine in the air. 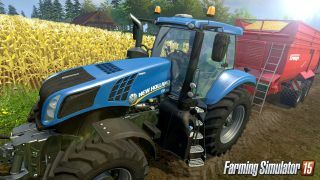 The latest trailer for Farming Simulator 15, titled “A Day on the Farm,” really wants you to feel what it’s like to toil in heavy machinery on a digital farm all day. Beautiful skylines are intercut with huge, nature-destroying trucks, happy farm animals, and a tractor not pulling aside to let the ever-growing line of cars behind it pass. Seriously dude, they’re honking. The trailer’s song sets the tone, and I can’t quite figure out if the video is making fun of itself, or us. Part of me thinks developer Giants Software is trying to be the Andy Kaufman of game studios, presenting a game about meticulously controlling every minutia of a virtual farm as though it were like any other video game. Is the trailer a brilliant joke? And if it is, are they actually in on it? I can't tell. But either way, it's got our attention, and this is the funniest (and perhaps most wonderfully earnest) game trailer in months. As the official site says, you’ll be able to “discover the freedom of woodcutting” when the game launches for PC first on October 30th at $30/£25.